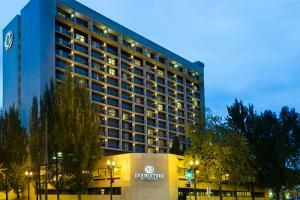 Ideally located in the center of the metro area, this hotel is within walking distance of the Oregon Convention Center, Moda Center and Portland Memorial Coliseum. Dining options include two on-site restaurants serving delicious local, seasonal ingredients. Guests can relax in the spacious accommodations that offer wonderful views of either downtown or the beautiful Cascade Mountain Range. For a spot of luxury, guests can upgrade to a suite and enjoy extra space and a private balcony overlooking the outdoor pool. Located in downtown Portland, adjacent to MAX light rail.